Manual versions are the simplest option available. Programmable thermostats allow you to automatically adjust the temperature in your home throughout the day (and therefore save on heating/cooling costs when you are not at home). Smart thermostats enable temperature to be controlled via computer, tablet, and smartphone. 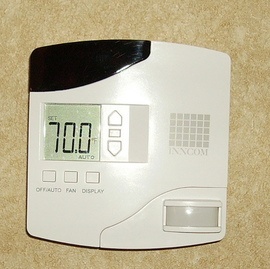 Manual thermostats are the least expensive type available on the market ($25 to $60). Programmable thermostats are more expensive initially ($90 to $150) but may save up to 33% on heating costs and 15%-25% on cooling costs. Smart thermostats are the most expensive option ($200 to $300).